After weeks of (ahem) gentle reminders from Cheryl I have finally sat down to write my half of the bucket list for our forthcoming trip to Dubai. I seriously cannot adequately express how excited I am to be going! Technically I have been to Dubai before, but I don’t think a lay-over in the airport can legitimately be counted as experiencing the real Dubai. I’ll be honest, it’s not a place that I’d ever particularly thought about visiting. As something of a culture vulture I was put off by Dubai's ultra-modernity, and seeming lack of history. It wasn’t until Cheryl suggested the trip, and I really started researching the city, that I realised that Dubai is FULL of culture; I just needed to readjust my understanding of the word. Dubai has grown inexorably in a single generation from a sleepy port, to one world’s richest cities and fastest moving metropolises, and has a lot to offer a curious visitor. Cheryl has already (brilliantly) covered a few of the main sights I’m looking forward to experiencing, including the Burj Khalifa and desert safari. I’d thought I share with you a few more of the experiences I’m most looking forward to whilst visiting “The City of Gold”. I’m not usually a beach holiday kinda gal (I can only manage a couple of days before my mind feels like it’s going into atrophy), but Dubai has some of the most beautiful beaches imaginable. Many of the beaches are owned by the hotels they’re adjacent to, but there are a few public beaches available to non-hotel users. 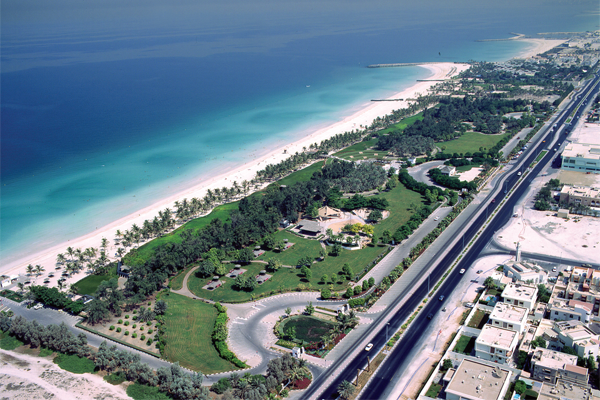 The jewel in the crown is the Jumeirah Beach Park, a blue flag beach in the popular Jumeirah area of the city. This stretch of paradise overlooks the Arabian Gulf, making the water a balmy 32 degrees Celsius. It also boast beautifully manicured gardens, BBQ facilities, and volleyball courts. I’m mainly looking forward to simply relaxing in the sunshine, catching up on my reading, and enjoying the crystal blue waters of the Gulf. I just need to remember to pack the Factor 50 and my hat! Food food food food food. Who doesn't love good food? I am a HUGE foodie, which is slightly depressing at the moment as I am currently on a healthy eating and exercise kick to ensure I can fit into my wedding dress next July (of which Cheryl is my more than capable bridesmaid). However, when it comes to Dubai I fully intend to sample all the delights of the local cuisine, including schwarma, lamb machboos and ta'amia (falafel to you and me). I'm hoping this will be part of the Desert Safari Cheryl covered in her Dubai blog, as I fully intend to eat cous cous and houmous whilst under the Arabian sky! I understand Dubai also boasts some of the world's best international restaurants, including many popular American restaurants not currently available in the UK; including The Cheesecake Factory (cue Big Bang Theory geekout), IHOP and PF Chang. Cheryl tells me these aren't to be missed. Bang goes the diet! 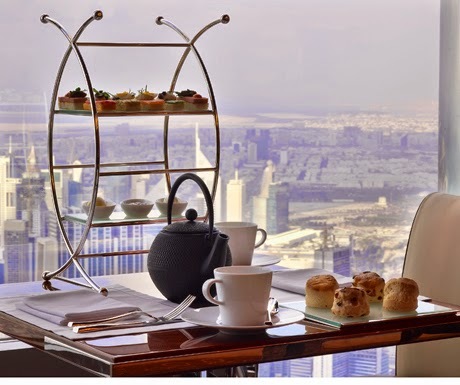 However the gastronomic delight I'm most looking forward to is afternoon tea, either at the Al Fayrooz Lounge (at the Jumeirah) or AT.MOSPHERE (at the Burj Khalifa). AT.MOSPHERE has possibly the most impressive view of anywhere in Dubai , towering 1450 feet above ground level, and is certainly not for the faint hearted! Afternoon tea is one of my favourite treats, and I think it'll be magical to be transported to a world of sumptuousness and elegance for an afternoon. Perhaps I'm imagining the majesty of Laurence of Arabia a little too much, but a girl is allowed her fantasies! I love boats. There's nothing better than the feeling of the wind in your face and the taste of salt on your lip. Therefore high on my list Yellow Boat tours which regularly run around Dubai Marina, the Palm Jumeirah and Burj Al Arab. This 90 minute journey costs 280AED (about £45), and will, undoubtedly, be a photographer's dream. We'll be able to get an intimate view of skyscrapers that Dubai is famed for around the world, and hopefully get some insider's knowledge as to the cities past, and it's future. 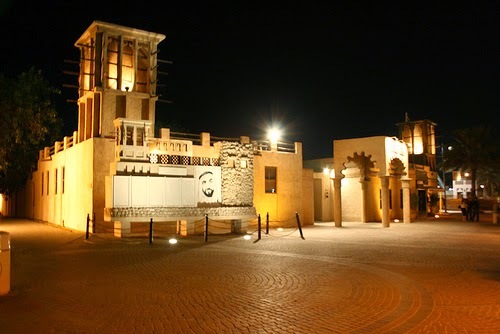 This was built in 1896 by Sheikh Maktoum bin Hasher al-Maktoum (grandfather of current Dubai ruler Sheikh Mohammed) and was home to the ruling family until Sheikh Saeed’s death in 1958. As well as being architecturally beautiful, the building is a reminder of life in Dubai pre-oil, and has an extensive collection of photographs of Dubai taken in the 1940s and ‘50s. With all the modernity of Dubai it’s these little enclaves of traditional history that I will cherish most. They serve as a reminder of Dubai’s ancient earthen roots in a city now constructed of glass and air. Natalie has her own blog, and occasionally remembers to update it. You can visit it here.